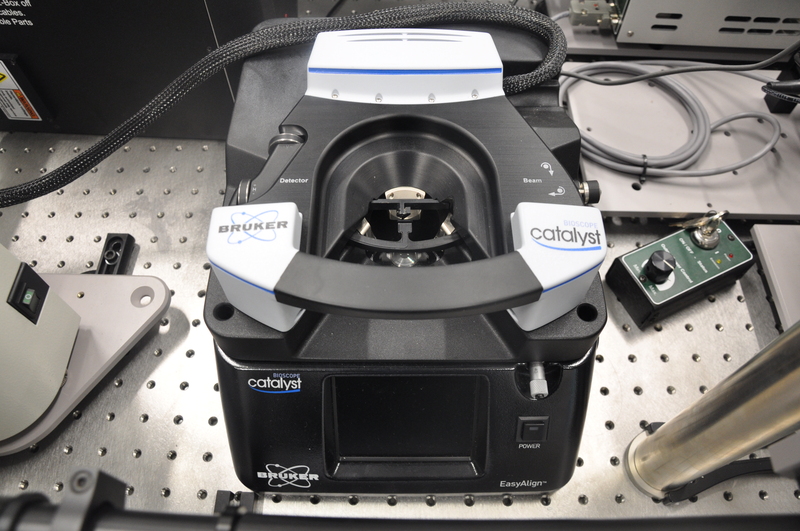 The microraman spectrometer combined with the bioscope allow simultaneous measurements of molecular dynamics (including surface mapping) and surface physical properties using a multimode atomic force microscope (incorporating latest PeakForce Tapping innovation). Raman spectra collected from the multiwall carbon nanotube shows three characteristic bands: G, D and RBM. Band G is related to bulk carbon structure, band D to disorder in the carbon nanotube and band RBM to a radial breathing mode. A wave number of the RBM depends on diameter of the tube. The microraman spectrometer combined with the NT_MDT SNOM allow simultaneous measurements of molecular dynamics (including surface mapping) and physical properties which can be investigated using light e.g. surface plasmons, optical transmission and reflection. Share forces, multimode atomic force microscope as well as thermal properties measurements are also available in this set up. Presented in Fig.2 result of the surface mapping mode shows a nonuniform graphene sample. The 2D peak related to number of layers of a graphene flake, mapped over a sample surface, reflects change in the sample’s thickness. 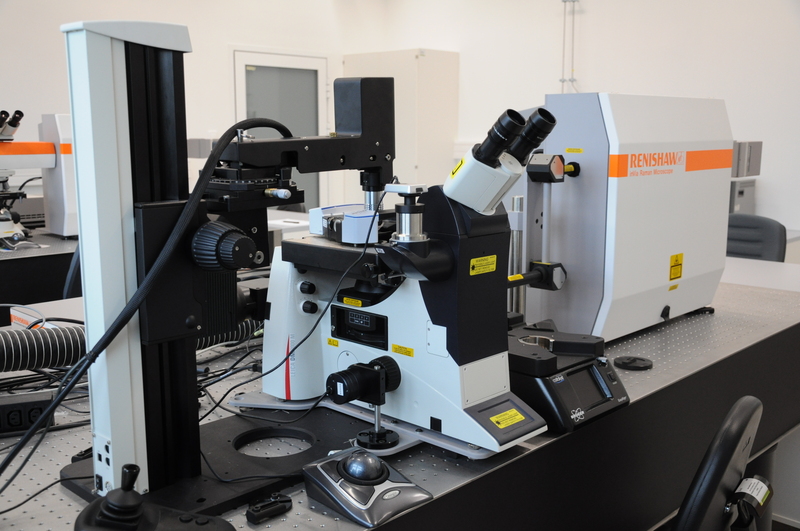 The optical microscopy lab provides instruments for studying the structure, dynamics and optical properties of matter in the nano- and micro-scale. Each of the three microscopes may serve as a regular optical microscope operating with magnification of ~1000x both in the bright field and fluorescence mode. 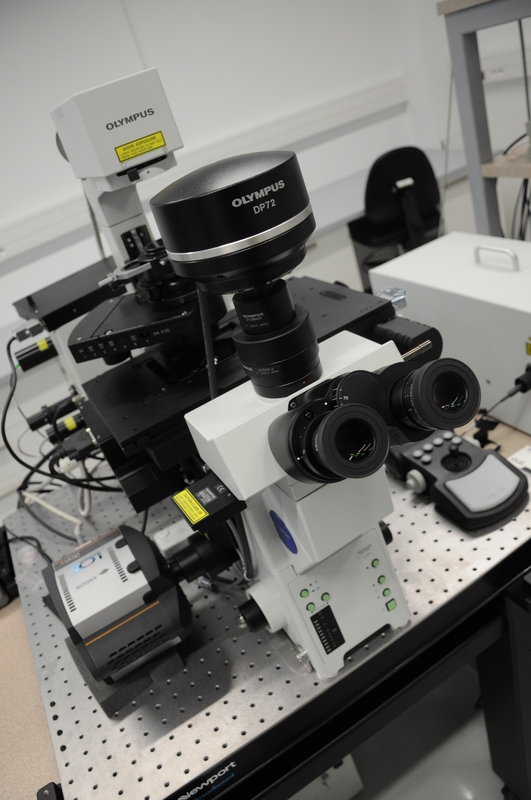 Each of the three microscopes may work in the mode of the laser scanning fluorescence microscope in order to obtain precise images of fluorescently labelled samples. A broad spectrum of excitation wavelenghts is available. 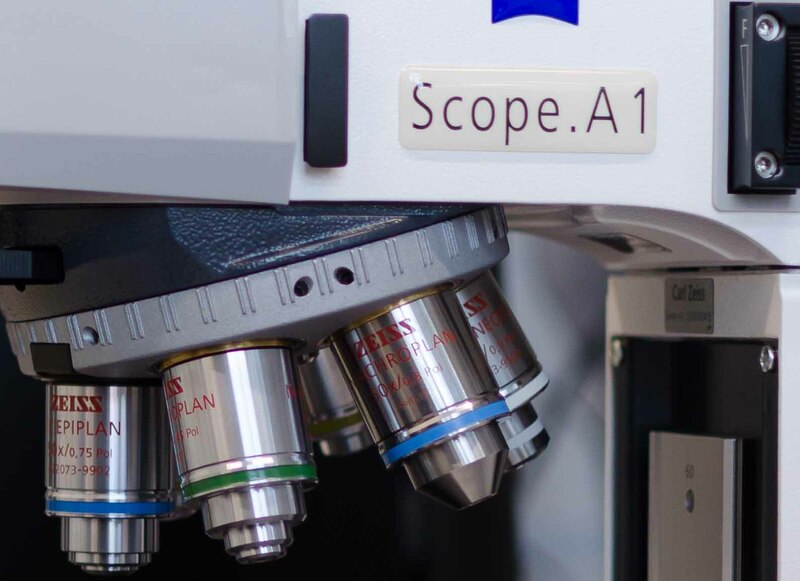 Each of the three microscopes may perform spectral measurements which allows measurements of fluorescence spectrum of single molecules or of sub-micron regions of the sample. 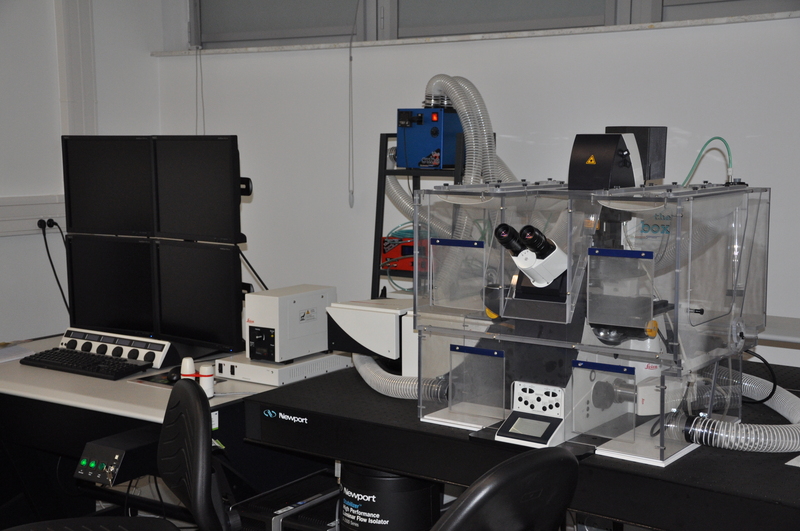 Each of the three microscopes can measure the kinetics of fluorescence fluctuations (fluorescence correlation spectroscopy – FCS) which allows for measurements of diffusion coefficients of fluorescently labelled particles in extremely low concentrations (nanomolar). 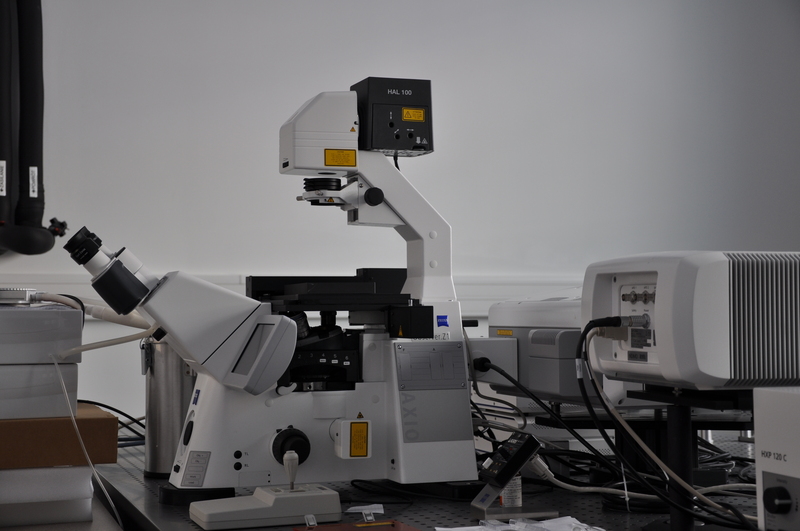 Olympus microscope has two special options: FLIM (fluorescence life-time imaging) and TIRF (total internal reflection imaging). 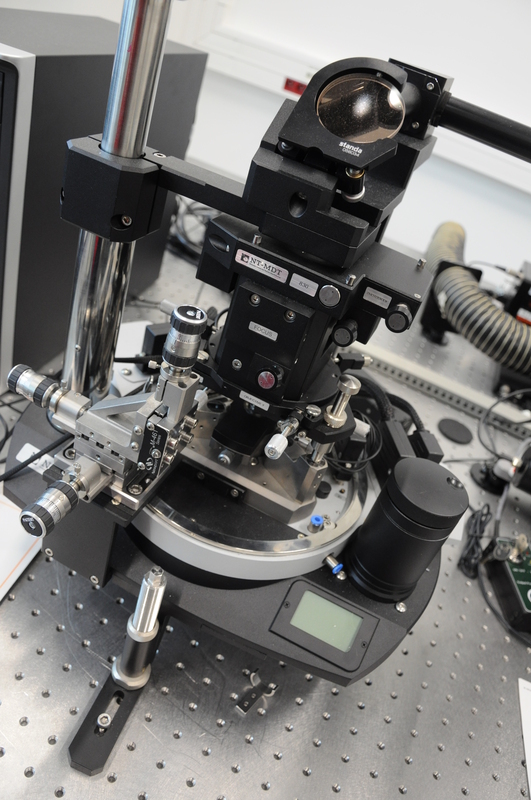 Zeiss microscope is equipped with a tunable femtosecond infrared laser used for two-photon excitation. Leica microscope is equipped with a tunable visible laser (“white laser”) and the STED super-resolution option (stimulated emission depletion) extending the resolution to ~40 nm range.